This post is sponsored by Breton crackers. All opinions are my own. Can I make a confession? Despite loving great food, if I could eat cheese, crackers and a glass of wine for dinner, I’d be a happy camper. My earliest memories of crackers were at adult parties. Reserved exclusively for the adults with fancy spreads or topped with tidy slices of cheese while the kids were dismissed downstairs with an alternative non-memorable snack. Crackers seemed like ‘fancy food’, not to be eaten outside of an ‘occasion’. Times have changed and the world of crackers has exploded offering almost every flavor, ingredient, imported, raw; you name it and you most likely can find it. Being gluten free has narrowed the cracker playing field for my kids (who are also gluten free) and me however. Not all crackers are available in a gluten-free equivalent. It can be a bit of a Goldilocks experimentation as well. Some are too hard, some are too soft and we are always on the hunt for the one that is ‘just right’ with great flavor, quality ingredients and good consistency. Despite still personally having a residual mindset of crackers being for an occasion or deliberate recipe, in my house that is not so for my kids. I realized recently I will buy a box of crackers with a recipe in mind and most often they are gobbled up before my recipe hits the table. For my son especially, they go to school in his lunch and are an after school snack replacing chips of any sort since he has braces. We were very excited to try a new gluten-free cracker from Breton. I loved Breton crackers before becoming gluten-free for the ample size and great flavor but waved good bye when gluten was no longer in the picture. Fortunately I had multiple boxes of the newly discovered crackers on hand as they began to quickly disappear as soon as the cellophane wrapper was opened! They are completely flavorful and satisfying on their own though I was determined to whip up something to serve with the Black Bean with Onion and Garlic crackers for our Cinco de Mayo celebration! I personally was delighted to have discovered an option that is a perfect pairing for Mexican food. The crackers have a wonderful natural flavor of black beans, onion, and garlic without being overpowering, a great texture, no artificial colors or flavors, as well as 2 grams each of protein and fiber in a serving (something that can be lacking in gluten-free crackers and baked goods). Entertaining can be overwhelming especially if time is short. I’m a firm believer in having a battery of proven recipes on the ready so I can enjoy my company while they are visiting, or make something quick to give any day a party-feel. This Cream Cheese Bacon Salsa Spread could not be easier. Other than cooking the bacon, everything is put into the food processor or blender and turned into a creamy spread. It can be made ahead of time or minutes before serving. If you like things spicy (I do) the type and heat level of the salsa you add will keep that under control or pump it! The flavors are a perfect match with the Bretons Black Bean crackers as well. Fortunately I hid a few boxes before they were devoured to celebrate with the spread too! 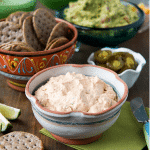 A simple spread made with tangy cream cheese, smoky bacon and mild or hot salsa, along with other fresh ingredients is a mouthwatering hit of any entertaining. 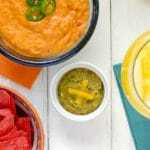 The spread's flavor may be changed with the type of salsa, as well as its heat level. I used a smoky chipotle salsa that was a wonderful compliment to the bacon and cream cheese. Pairs perfectly with Breton Black Bean with Onion and Garlic gluten-free crackers. Add the scallions and garlic to the bowl of a food processor or blender. Pulse to process into smaller pieces (will be processed again with the rest of the ingredients so the pieces do not have to be very small). Add the remaining ingredients (cream cheese, bacon, salsa, sour cream and chives) and process until all the ingredients are fully combined and the spread is creamy. Place in the refrigerator in a sealed container to thicken (10 minutes or longer). Serve with a spreading knife and sliced pickled jalapeno pepper slices as optional garnish. 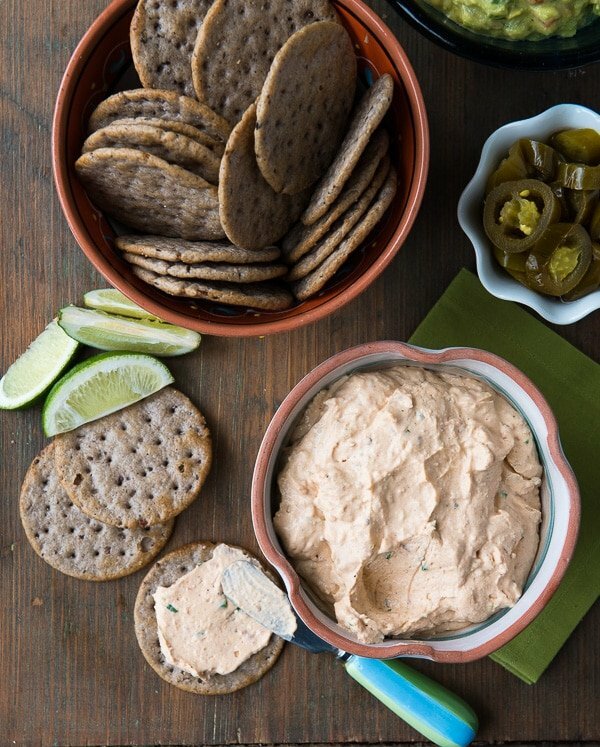 Black bean crackers sound like a match made in heaven!! I could eat crackers and dip every day! Oh, yeah! I’m with you on the cheese and crackers for dinner! And I need to find those Breton crackers—what a marvelous flavor! 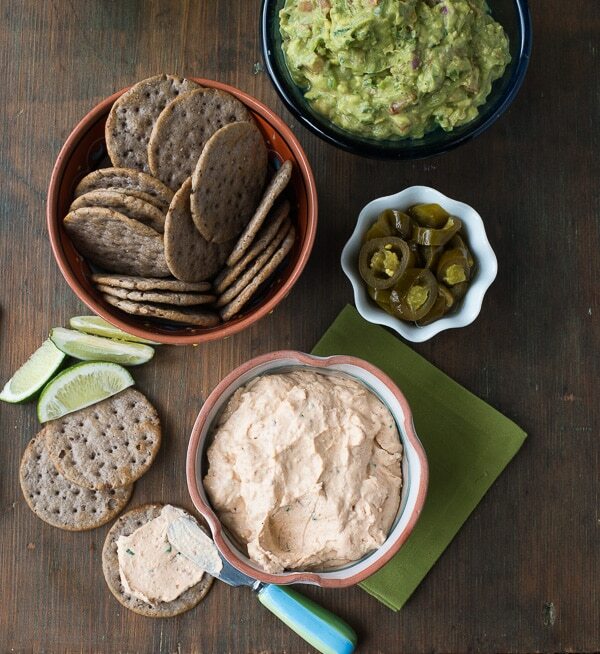 Tony, that dip looks fantastic and love the black bean crackers! So glad you like it Sandy! Oooo I am so intrigued by these!!! 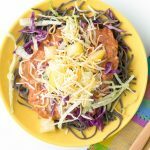 Love the idea of black bean!! Don’t you? I too was very excited about black beans especially in seeing the ingredient list. Black bean crackers sound so interesting! I bet they go perfectly with that creamy dip. They really are delicious Mary Frances and pretty irresistible with the crackers! I love this idea! 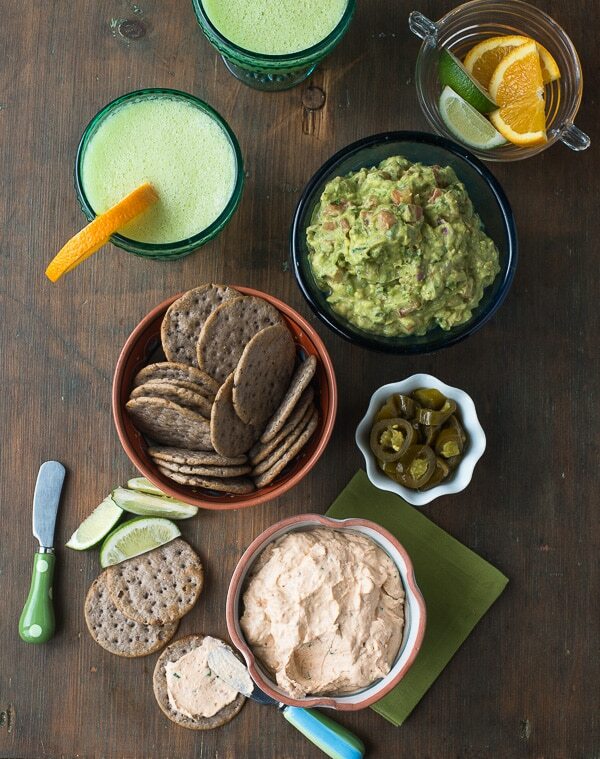 What a flavorful spread and it’s perfect how quick it comes together. This would be fabulous for entertaining! Thank you Faith! 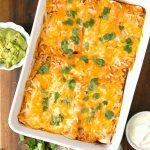 It was a perfect addition for Cinco de Mayo and I’m sure we’ll be making it often. 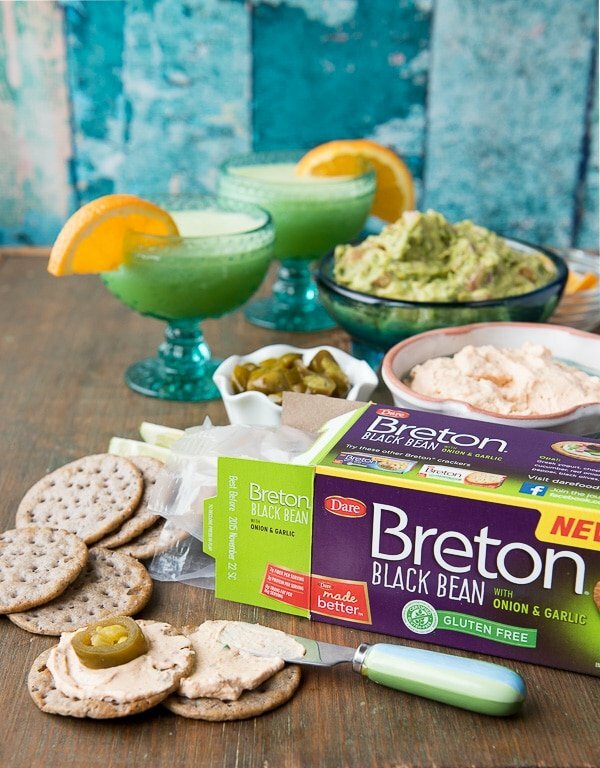 We love Breton crackers – and our favorite guilty pleasure is making a dinner out of crackers and dip!! I’m so happy they now make gluten-free crackers. I’ve missed them! This dip will definitely be tried when we get back home and I am sure it will soon disappear! I hope you will Sue! I have to admit I did enjoy my fair share of it. Breton crackers are my weakness! I can eat the whole box by myself! Loving the spread! I’m the same way Anna! Glad you like the spread! I haven’t had a chance to try the new Breton crackers, but they sound great. Love the flavours in the spread, too! I really love the cracker flavors and am sure you will too if you try them! Glad you like the spread! Oh my gosh, i KNOW. If I could get away with having snacks for dinner every night (especially crackers and dip), I would definitely do it. 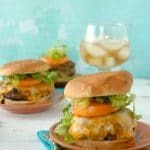 This recipe looks absolutely amazing. 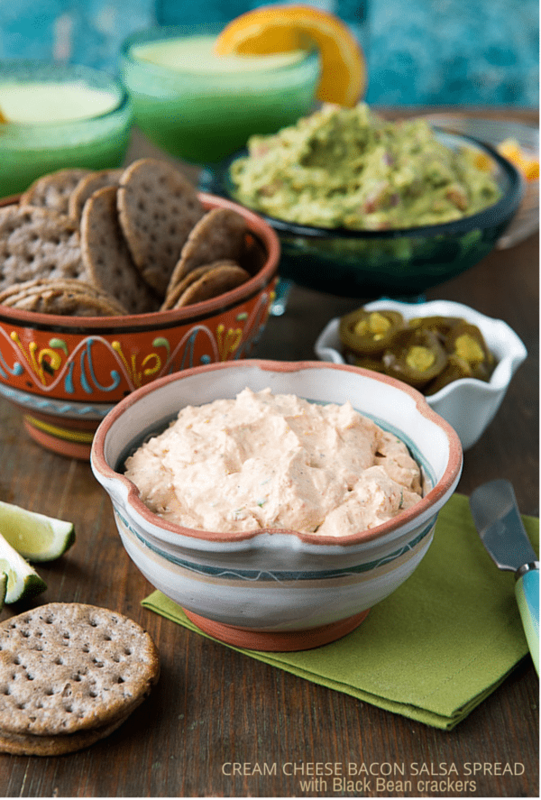 This dip is the kind that would be gobbled up in about 2 minutes at my next party! Glad to know I’m not alone Lori! I usually don’t have dip around or else that is all I’d be eating. Okay, like ALL my favorite things in one dip!!! Brilliant. Thanks Carolyn! I feel the same! Oh, Lord, Toni, reading this recipe is a religious experience. Not fair before breakfast! I was at a lovely pot luck luncheon in Sacramento over the weekend and am inspired by the skill of the hostess to entertain more myself, and now you’ve given me the confidence in the welcoming hors d’oeuvres to go ahead. Thank you. The key will be to invite enough friends that I don’t manage to eat the whole thing this myself! It isn’t easy to have it in the fridge I’ll admit! But a perfect reason to gather up some friends. 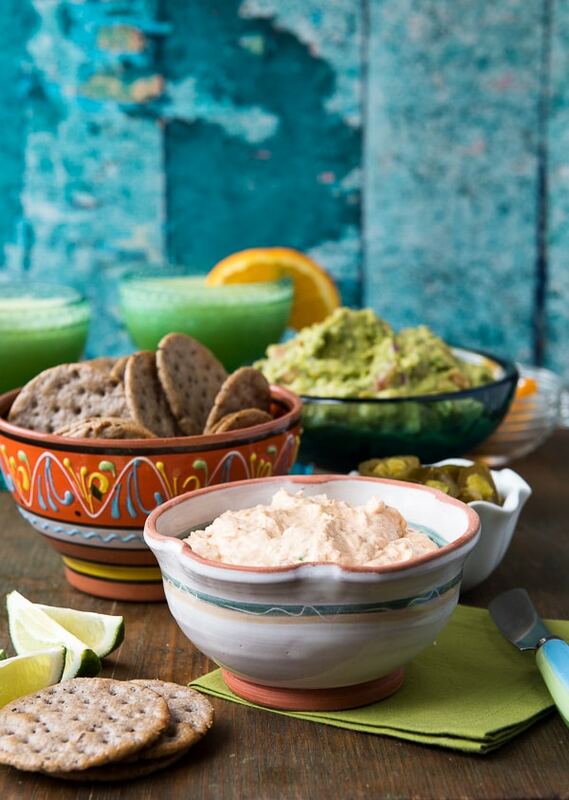 Wow – this dip looks and sounds perfect. I would never have thought to put it in a blender or food processor but that is brilliant! Love those crackers – they sound delicious. Happy Cinco de Mayo! Even after the cream cheese is softened it can be hard to mix everything easily. The food processor really mixes it all together so it’s smooth and creamy.